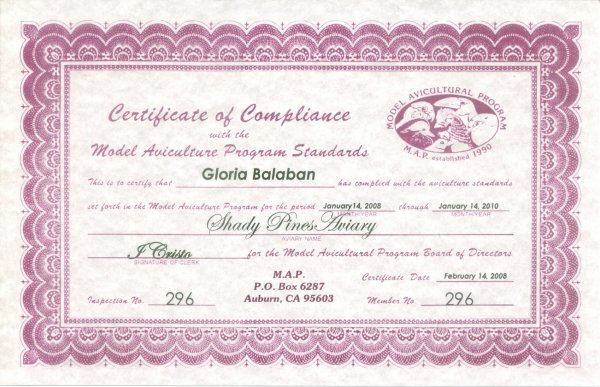 Shady Pines Aviary has been MAP certified since 1995. Re-certification requires annual or bi-annual veterinary inspections. This assures our customers that any bird purchased from Shady Pines Aviary is raised under the strict guidelines of the Model Aviculture Program. MAP is a national voluntary program established in 1990 for the certification of aviculturists (bird keepers, bird breeders, and bird dealers) through a system of inspection by avian veterinarians. MAP is designed to improve the care and breeding of exotic birds. MAP will facilitate the preservation of avian species through education and improvement in the care of exotic birds. Any person keeping or breeding avian species in the United States is eligible to participate in this voluntary program. To establish guidelines for avicultural practices and to improve avian health and husbandry. To encourage the maintaining of accurate records on exotic birds. To increase the quality of offspring and the productivity of breeding pairs. This program is not run by state or federal agencies; it is governed by a Board of Directors consisting of aviculturists and avian veterinarians.